Note: In addition to our traditional detailed demographic chart for the top 25 cable originals, be sure to try our new expanded searchable table for the top 100 originals on cable at the bottom of the post. NETWORK UPDATE: FAMILY GUY and DATELINE gained 0.1 in final numbers. 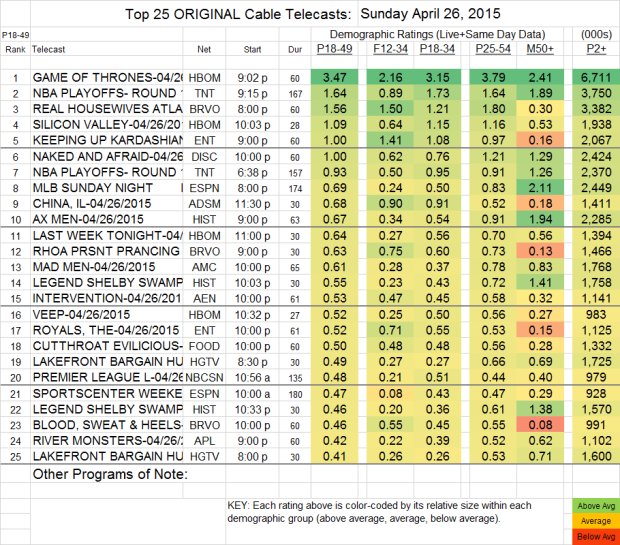 CABLE HIGHLIGHTS: GAME OF THRONES (HBO) lost a tenth it could spare, down to 3.47. SILICON VALLEY rose 0.12 to 1.09, then VEEP gained 0.03 to 0.52, and LAST WEEK TONIGHT dipped 0.07 to 0.64. On Showtime, NURSE JACKIE dropped 0.07 to 0.18, and then HAPPYISH (which had previously had its pilot available online and on VOD, and had also aired it as a “sneak” a couple of Sundays ago) debuted at 0.06, with 232K total viewers. MAD MEN (AMC) fell 0.04 to 0.61. SALEM (WGN America) dropped 0.05 to 0.12. Lifetime’s LIZZIE BORDEN CHRONICLES climbed 0.02 to 0.24. The night’s NBA PLAYOFFS on TNT were at 1.64/0.93. Bravo’s REAL HOUSEWIVES OF ATLANTA jumped 0.31 to 1.56, with BLOOD SWEAT & HEELS up 0.04 to 0.46, and FASHION QUEENS down a tick to 0.24. On E!, KEEPING UP WITH THE KARDASHIANS was also down a hundredth to 1.00, and THE ROYALS gained 0.07 to 0.52. Discovery’s NAKED AND AFRAID slipped 0.14 to 1.00. AX MEN (History) rose 0.19 to 0.67. Adult Swim’s CHINA IL was up 0.18 to 0.68.